On July 23, Mumbai biker Jagruti Hogale was crushed to death by a truck after she fell off her motorcycle when it hit a water-filled pothole. And in August, Usha, a Delhi school teacher was run over by a tanker after she fell from her husband’s scooter that had hit a pothole. The potholes in India are virtual death traps, causing motorcyclists and scooterists to fall off. It is exceedingly dangerous during the monsoon season when it gets filled with rainwater and it becomes impossible to judge the depth. 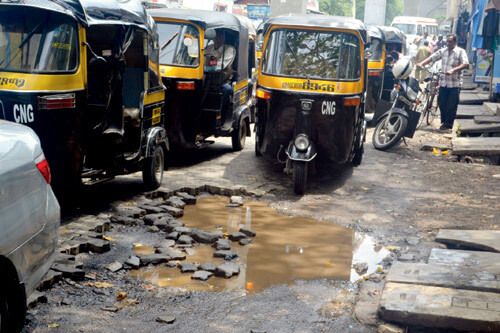 Many two-wheeler riders have been thrown off balance by deep pot holes. Official statistics show that potholes accounted for 6,424 road accidents & 2,324 fatalities in 2016. According to the report ‘Road Accidents in India-2016’, which was released by union minister Nitin Gadkari, about 37 per cent of total accidents took place on traffic junctions with 72.9 percent on uncontrolled ones, underscoring the importance of traffic control mechanism at junctions. As many as 9,583 accidents and 3,396 accident deaths were attributed to speed breakers. The report said that road accidents in the country have decreased by around 4.1% during 2016, with the year seeing 4,80,652 road accidents as against 5,01,423 in 2015. However, fatalities resulting from these accidents have risen by about 3.2% during the same period. As many as 1,50,785 persons were killed in 2016 as against 1,46,133 in 2015. Gadkari said there has been a 3 % reduction in road accidents between January to July 2017, along with a 4.75 % reduction in road accident fatalities. While road accidents have come down from 243,870 between January to July 2016 to 236,458 during the same period in 2017, fatalities have come down from 79,354 between January to July 2016 to 75,583 during the same period in 2017. Road accidents deaths have reduced in 25 states and Union Territories in the first half of 2017. Only states like Assam, Bihar, Orissa and Uttar Pradesh seen increase in road accident fatalities between 2-8 % during this period. During 2016, 13 states accounted for 86 percent of the total road accidents in the country . These are Tamil Nadu, MP, Karnataka, Maharashtra, Kerala, UP, AP, Rajasthan, Telangana, Gujarat, Chhattisgarh, West Bengal and Haryana. Similarly, 13 States accounted for 84 percent of the total persons killed in road accidents during 2016. These are UP, Tamil Nadu, Maharashtra, Karnataka, Rajasthan, MP, AP, Gujarat, Telangana, West Bengal, Punjab, Haryana and Bihar. According to the report, the age profile of road accident victims for 2016 reveals that the youth of age group 18 - 35 years accounted for 46.3 percent (69,851 persons) and age group of 18-45 accounted for a share of 68.6% (1,03,409 persons) and working age group of 18-60 accounted for a share of 83.3 percent (1,25,583 persons) in the total road accident fatalities. Among the vehicle categories, two wheelers accounted for the highest share in total number of road accidents (33.8 percent), followed by cars, jeeps and taxis (23.6 percent), trucks, tempos, tractors and other articulated vehicles (21.0 percent), buses (7.8 percent), auto-Rickshaws (6.5 percent) and other motor vehicles (2.8 percent). The share of two wheelers in total road accidents has increased from 28.8 percent in 2015 to 33.8 percent in 2016. Based on the data reported by police, drivers’ fault is single most important factor responsible for road accidents (84 percent), killings (80.3 percent) and injuries (83.9) on all roads in the country during 2016. Intake of alcohol/drugs by drivers resulted in 14,894 road accidents (3.7 percent) and 6,131 fatalities (5.1 percent). The act of talking on mobile phones while driving has resulted in 4, 976 road accidents, 2,138 road accident deaths and injuries to 4,746 number of persons during the calendar year 2016. Overloaded vehicles caused 61,325 (12.8 percent) road accidents and 21,302 (14.1 percent) deaths in 2016.